Halo 4 is a first-person shooter video game developed by 343 Industries and published by Microsoft Studios for the Xbox 360 video game console. The game was released in most territories worldwide on November 6, 2012. Halo 4's story begins four years after the ending of Halo 3; the player assumes the role of the Master Chief, a cybernetically-enhanced supersoldier. The story is mainly set on a Forerunner planet, where Master Chief encounters the collection of alien races known as the Covenant and ancient warriors of the Forerunner empire known as the Prometheans. Master Chief is accompanied by the artificial intelligenceconstruct Cortana. 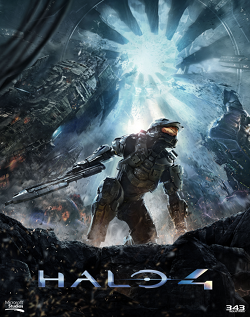 Halo 4 was officially announced on June 6, 2011, at E3 2011. On September 26, 2012, it was announced that the game's development was complete. Halo 4 grossed US$220 million on its launch day, with an estimated gross of $300 million in its opening week, marking a new record for the franchise.More than one million people played Halo 4 on Xbox Live within the first 24 hours of release. As of December 6, 2012, the game has sold approximately four million copies. The game received generally positive reviews from professional critics on release. Halo 4 constantly ups the ante in smart, satisfying ways. Everything might’ve changed under the hood, but 343 did what it set out to do: make a Halo that can stand tall with original developer Bungie’s revered classics. That’s no mean feat. If you want numbers, you get two 8-10 hour campaigns plus a deeply involving multiplayer. That’s a hell of a lot of game for your dollar. Not an Xbox Live Gold member? Wait until mid-January, shell out $10 for a month’s access, and nab all the extra Spartan Ops episodes in one go. Consider that my sound economic advice. It’s unfortunate that 343 didn’t stretch past the standard Halo playbook instead of falling back to so many recognizable gameplay beats (and I do wonder if that was a conscious decision meant to counter the “Will it be Halo?” doubters), but the gameplay itself offsets those issues. The level design is a precision instrument. Above and beyond that, Halo 4 expertly folds an intimate story into an epic scope, taking risks with iconic characters and sticking the landing every time. The Master Chief was heroic before. Now he’s a hero. Visit HALO Official Site for more!! Ανώνυμος 12 Φεβρουαρίου 2013 - 8:53 μ.μ. Usually it's caused by the fire communicated in the article I browsed. And on this post "Halo 4 Game & Movie". I was actually moved enough to drop a thought :) I do have 2 questions for you if you tend not to mind. Is it simply me or does it seem like some of the comments appear like coming from brain dead folks? :-P And, if you are writing on other social sites, I would like to keep up with you. Would you list every one of all your communal pages like your twitter feed, Facebook page or linkedin profile? News Worldwide 365 12 Φεβρουαρίου 2013 - 11:06 μ.μ. Hello, if you use google translate sometimes it returns incomprehensible content, but sometimes folks actually comment as if they were brain dead. But what can we d, that's life. You can follow us on Twitter or Like us on Facebook in order to be informed. Ανώνυμος 18 Φεβρουαρίου 2013 - 7:11 π.μ. And after this post "Halo 4 Game & Movie". keep up with you. Could you make a list every one of all your community pages like your linkedin profile, Facebook page or twitter feed? News Worldwide 365 18 Ιουλίου 2013 - 8:03 μ.μ. You can Subscribe by mail, on RSS Feed, Follow on Twitter, on Google Plus, or Like on Facebook for more. You can also join the site as a friend!